The term ‘craft’ generally applies to a skilled manual pursuit and is often associated with skilled trades that are undersubscribed to in the present day. This term ‘craft’ is often applied to a trade that takes considerable time and patience to master and this possibly derives from the history of craft-training, which was often long, disciplined and laborious, taking place under the guidance of a ‘master craftsman’. Such apprenticeships often had links with the church at a time when religion was rarely scoffed at – hence making the mastery of the craft a very serious matter! Stone masons and wood carvers are two examples of such trades that continue to the present day, although the training is now far less strict. ‘Craft’ is also applied to creative pursuits that are practical in their application, which has a purely aesthetic application. This leads many crafts persons to feel an inverse snobbery towards the more lucrative and loftier ‘Fine Arts’. Pursuits such as: Pottery, Stained glass, Knitting, Handicraft, Weaving and Wood Carving can lay claim to having a direct useful purpose which can enhance the life of people on a down to earth level. In this sense crafts predate many modernist art movements who claimed to want to bring art closer to the people. For its part, Fine Art (or its practitioners) dismisses crafts as not being as pure and free as art, due to craft works having a particular usefulness. A well made pottery vase, for example, can not make a claim to being truly free, as it exists in its capacity as a vase – something for putting flowers into. Despite the confrontation between crafts and Fine Art works, there are crossovers between crafts and the Fine Arts. 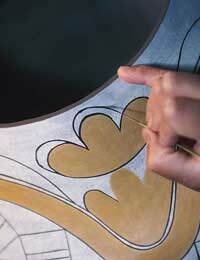 Indeed, craft skills such as stone carving and knitting are often used in the production of art pieces. Textiles based Fine Art has become particularly popular over the last few years and is something that the Crafts Council (who were established in 1971 to promote the Crafts) are very supportive of. It is unclear whether such hybrids of art and craft serve to dilute either the art or the craft, or merely signal a desire for artists to return to traditional production methods within their work. In either case a narrowing of the possibly unnecessary distinction between arts and crafts may be no bad thing. One major factor for those who make textiles based Fine Art is the ‘tactile’ qualities of the medium. A knitted Fine Art piece reaches out to be touched in the way a normal craft object may be touched, but not in way that Fine Art piece would. This narrows the distance between the object and the viewer, making for a more humble approach to the viewing of Fine Art. However, in many cases the touching of textile Fine Art is in fact prohibited in museums and galleries! The collecting of craft works may underlay a particular preference for crafts over Fine Art for any of the reasons discussed above. There is no reason, however, why crafts may not be collected alongside Fine Art pieces, and given the wide range of things that fall within the remit of ‘craft’ it would, in fact, be difficult not to possess a number of craft items in your home, if not in your collection! Crafts vary greatly in quality and in price, with some objects holding their value extremely well. To find a niche in the crafts market (focusing, for example, purely on the collection of Swedish glassware) could prove very lucrative, considering the vast array of different items available, and the popularity of unique items amongst collectors. Crafts fairs are a good place to start looking when building a collection, whilst knowledge of the history and social context of crafts could also prove invaluable. Great!!! At last someone who appreciates that art and craft are interlinked.I use the term artisan to try and bridge the gap. THANKYOU!